The modern age, say the last 100 years, has done more to advance mankind than at any other time in our history. Great strides have been made in technology, health, and transportation. The advancements in transportation have made even the farthest corners of the earth accessible in only a few hours. As a point of reference: From Los Angeles to Washington D.C., the SR 71 Blackbird made the trip in under 70 (yes, seven – zero) minutes… almost 30 years ago. While this fast-paced pattern of “make, then break” records has become the new norm, there are some ideologies in each industry which persist in urban myths, dogma or just plain falsehoods and must be tirelessly worked to dispel them. With regards to transportation, one of the most egregious misnomers is the slower you go, the less likely you are to be injured and this falsehood is easy to dispel because physics and inherent math verifies the truth. Consider the advancements in vehicle safety and design. There was a time when vehicles did not have any safety equipment. These vehicles would crash and stop; under Newton’s laws, the occupant would keep going at the same speed the vehicle was traveling at and collide with the interior of the vehicle. In this collision, there was the sudden stop for the car, but not the occupant; the result… Injury. The safety advancement: Lap belts. You no longer hit the inside of the vehicle in a crash, the seat belt did its job to keep you from the sudden stop but the lap belt put extreme, sometimes paralyzing strain on the occupant’s body. The lumbar spine is not designed to keep the top half of you in place during a crash and there is the space that normally resides between the occupant and the seatbelt at some point. Again, in a very short amount of time, the occupant is forcibly colliding with the seat belt, even if it is an inch. However, different parts of the spine are not designed to support adjacent regions with these forces and the adjacent spinal regions have to attempt to stabilize forces it was not intended to stabilize. The safety advancement: Shoulder belts. 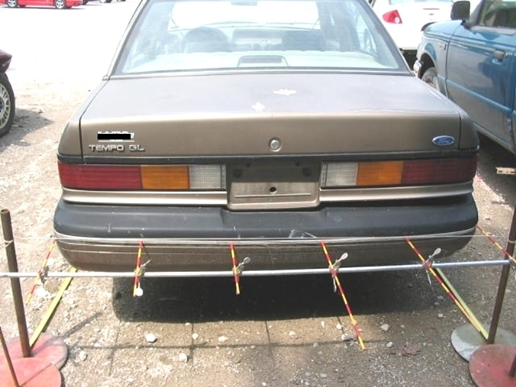 These were designed to restrain your upper body and not stress your lumbar spine and again you couldn’t hit the inside of the vehicle in a crash. The shoulder belt did its job to keep you from the sudden stop and hitting the interior of the car, but this design has some flaws too. First, it can distribute the forces unevenly across your body. Secondly, now that your upper body is restrained, your cervical spine has to keep your head in place during a crash – a job it’s not designed to do. In addition, the sudden stop of your body means your organs can crash into your skeleton and each other. The safety advancements: Airbags & designed failure of the seatbelt. Most vehicles on the road today have a big bag of air waiting to deploy in the event of a collision and for front-end collisions, the sensors are located in the front, while the side airbags have side sensors, and both will only deploy if those respective sensors are activated through significant force and resultant deformity of the vehicle. This bag is coupled with seatbelts which will stretch at a predetermined point, and the goal of both is for you to not be stopped so suddenly, in other words, to attempt to give you more time to come to a complete stop. The safety advancement: Crumple Zones. Manufacturers discovered they could make a vehicle fail in a way that was predictable. This expected behavior meant the vehicle could take extra time to crush (usually in milliseconds) and further extend the time it takes an occupant to slow down. Safety Advancement Conclusion: These advancements in safety do nothing if the nature of the collision renders them useless or the collision is not violent enough to “need” them (low speed). Seatbelts and Airbags do nothing for an occupant of a vehicle which is rear-ended. If a vehicle has a collision which is not severe enough to deploy the airbag and stretch the seatbelt then both these features are useless for safety. If the vehicle cannot crumple or does so minimally, then the occupant doesn’t get the benefit of the energy absorbing design. The safety advancements in modern vehicles are designed to increase the time it takes for you to slow down, but if they are not available to you (as is the case in low-speed crashes), then you are no better off than being in a vehicle with no safety features at all. The next logical question, “How fast can you go and still have the collision be low-speed AND suffer an injury?” is a complex one. There are dozens of variables which dictate the outcomes of a crash, and as such, each item is a subject onto itself, however, to list a few vehicle types, vehicle mechanical condition, speed, the angle of collision, etc. 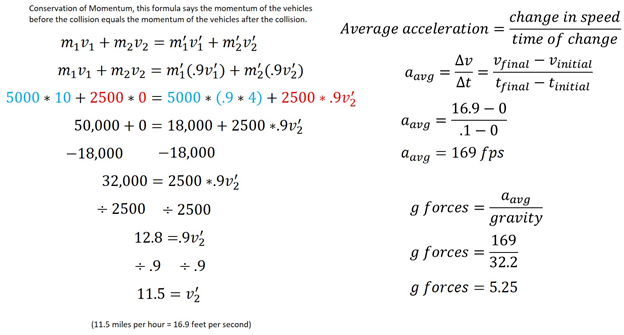 The answer will come from the math of the forces involved, along with the vehicle and occupant “known information;” the weight of the car and the occupant, the speed of the vehicle, the braking distance, etc. and then apply it to a sample to illustrate how to understand Low speed can equal high energy. We are going to focus on the forces transferred from one vehicle to another. 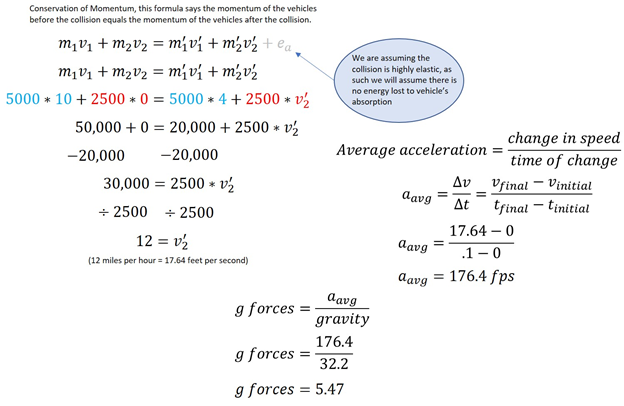 Understanding how a vehicle behaves in a low-speed event and how the forces are transferred is the key to the debunking the myth of “low speed = no injury” because it is not about the speed, it is about the energy the occupant is exposed to as a result of the crash. For the moment, let us assume the collision doesn’t use the crumple zones or any built-in, predictable, deformation to the advantage of the occupant. We will also assume there are two carts and striking cart weighs twice what the victim cart weighs (including any occupants) and the striking vehicle has a post-impact speed of 4 miles per hour. Some basic calculations result in us knowing the change in speed for the red cart to be 12 miles per hour. Further, if the change happened in .1 seconds the red cart occupant would experience 5.5 gs at the lumbar spine. To fully understand how that is derived, and the injury potential, we need to calculate the “G-Forces” the occupant’s body is exposed to in this “low-speed” model. It’s all in the math (physics) that is often confusing, but the final numbers bear significant injury potential. Now, in the real world, the vehicle will always absorb some of the energy, the transfer is never 100% efficient. Let’s change the scenario a little bit. What happens if both carts absorb 10% each, totaling 20% of the speed lost to crumple zones? Again, if the change happened in .1 seconds the red cart occupant would experience just over 5 g’s at the lumbar spine. The math here is greatly simplified for a demonstration of concept, (energy absorbed) is a complex process detailed in other programs. The above is not a proven method for actual collision reconstruction. In both examples 10 miles per hour is a very striking low speed in the grand scheme; it’s a common collision speed among parking lot and heavy traffic collisions. The g-forces experienced at the cervical spine are two-three times that of the lumbar spine. In both examples, the cervical spine would experience at least 10 g’s to 15 g’s of force, which is well above the injury threshold at either end of the spectrum. Let’s add some real-world context to this concept. 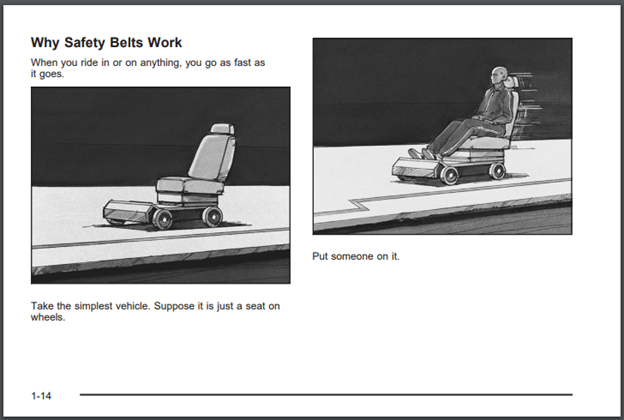 Below are photographs from the NHTSA database. The listed change in velocity for this vehicle is 12 miles per hour. This vehicle was also rear-ended, the listed change in velocity is 8 miles per hour. 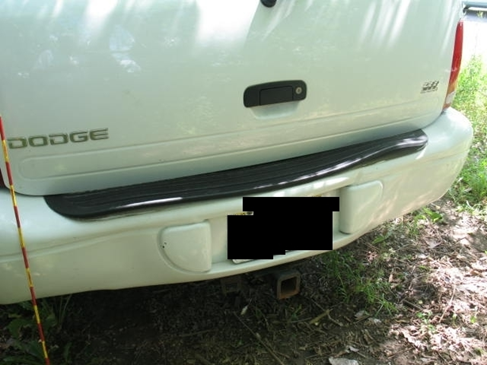 In both cases, the database reports (See the links to the NHTSA below) at least a cervical spine injury, but as you can see, there is little damage to the vehicles. While several factors must be considered to determine if the injury is a result of a car collision, at the same time, the lack of damage or appearance of speed doesn’t negate the possibility. Injury can, and often does, occur in what seems to be the most miniscule collisions. There is no validity to “low speed = no injury” as that is nothing more than an “urban myth” or dogma.